I’m almost finished with a mosaic skateboard I need to turn in today for an art show I’m in. All I have left to do is clean up the grout. Oh boy…my favorite part of mosaic art. I sure am wishing I had used Streuter Technologies groutless adhesive. Idid use their No Days adhesive, but wish I had the groutless. I’ll have to get some. It’s a thicker adhesive that works just like the No Days adhesive film. They have a video over at their site that shows you exactly how to use it. 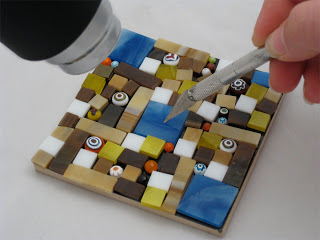 No clean up worries…mosaic art in less than half the time. Sounds good to me!